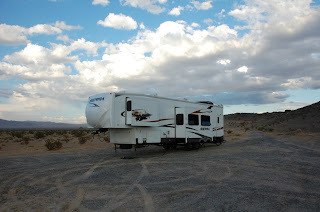 We really loved the Mojave, so much that we stayed 5 days instead of 1 AND we stayed for free! Gotta love it when the rangers say yeah, just pick a spot and stay a while! 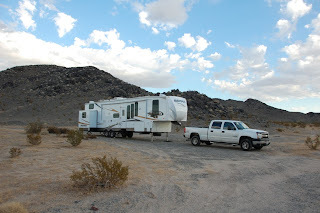 So we picked a great spot, down a "road" (that term's used loosely in the Mojave), that was just close enough to the (only) town nearby so we could get internet, and didn't see a soul there for 5 days! We only saw 3 people in 2 days when we took some long, beautiful hikes. Seriously, we had 1.6 MILLION acres to ourselves and we fully enjoyed it! Sand dunes, volcanoes, lava flows, lava tubes, Joshua Trees, canyons, mountains, rocks with giant holes (at Hole-in-the-Wall), critters of all kinds (fortunately for me, not for the rest, we didn't see any rattlesnakes or scorpions, only one dead tarantula), colorful hills and valleys, and insane 4 wheel roads paths, so fun! We even stayed home a few days to work (and watch the Reds) while the kids played outside. And, the weather was BEAUTIFUL! 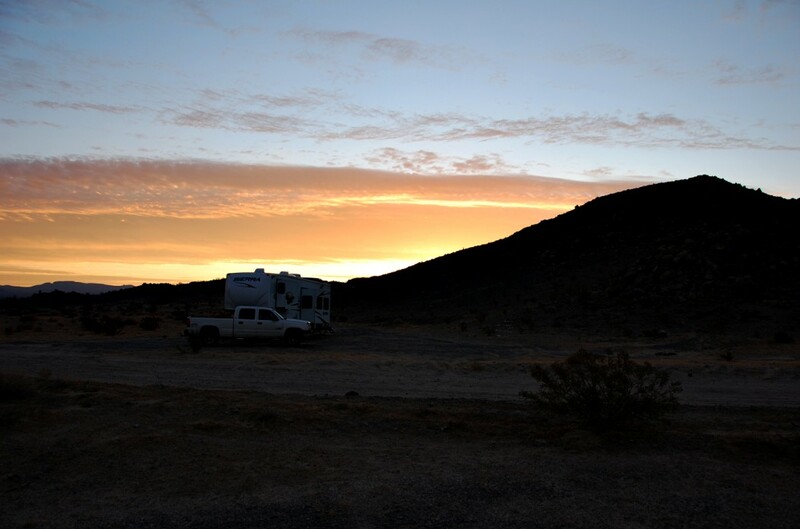 60s and 70s, yeah, in the desert! Perfect for hiking, or sitting at home and not needing the AC! 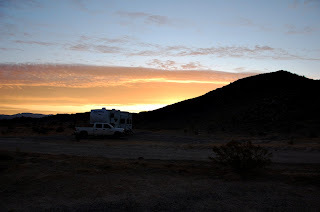 Our campsite, middle of the desert, and we had everything we needed: water, electric (generator/battery), internet, and even satellite TV (the Reds are in the playoffs!). And pics from our hike in Caruther's Canyon, which is great, if you can find it! Here was their note: Warning: the routes described below are not established trails; trail heads might be unidentifiable or nonexistent. Yeah, it was unidentifiable, but we managed, and loved it! Found an old mine at the top too. If you ever look for it, take the 3rd path to the right, turn at what looks like a creek bed, go over the washed out path, slowly, and blindly choose from any number of paths that shoot off of that one. They might be animal paths, just back up and try another. Worked like a charm for us. 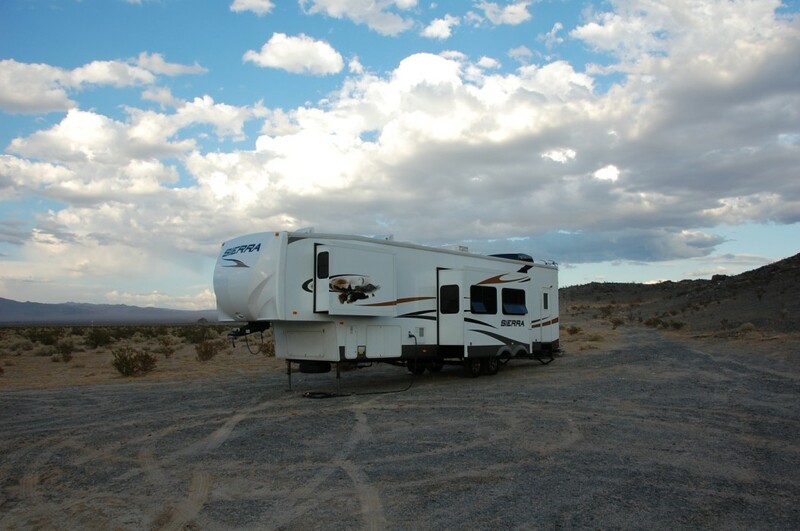 Oh, and expect scratches on both sides of your really big truck (cause no other vehicle should try it)! But Allison didn't mind, they add character. Oh man, people just drive through and you'd never know. It's awesome to have time to explore!